Heat the canola oil and three kernels in a large covered stockpot on high heat. When the 3 kernels pop, the oil is hot enough to add the rest of the popcorn, so add the remaining kernels in an even layer on the bottom of the pot. Cover and remove from the heat for 30 seconds then put back on high heat. Once the kernels start to pop rapidly, gentle shake the pan to ensure the kernels on the bottom don’t burn. Once there are a few seconds in between popping kernels remove from the heat, carefully open the lid and pour into a large bowl. 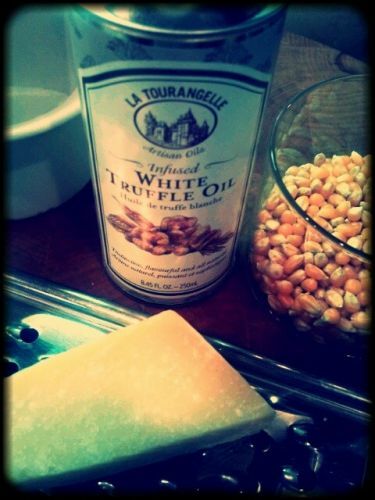 Drizzle with the White Truffle Oil, shave fresh Parmesan, sprinkle with Sea Salt to taste, toss and enjoy!